If you are in Galicia in October you should not miss the festivities of San Froilán in the city of Lugo. From 4 to 12 October there are concerts, shows, craft shows... lots of fun. But the star of this party is the octopus! In early October multitude of tents are installed in Rosalía de Castro park , where you can taste this delicacy of Galician cuisine. 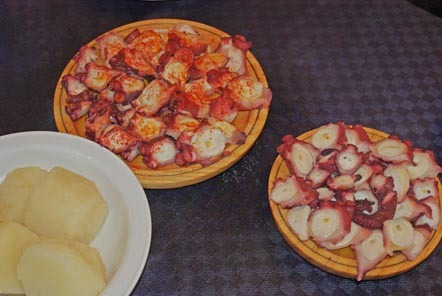 The most traditional way to cook the octopus in Galicia is pulpo á feira, which involves cooking it in a copper saucepan, cut it and serve it together with boiled potatoes. It is seasoned with oil, salt and paprika, all gluten-free! We enjoyed the delicious octopus and also carne ó caldeiro, which is veal meat boiled with vegetables. The restaurants will be opened until November 4th, so you still have time!